(an-ÿ-sot -ŏ-pee) A dependence of physical properties upon direction; a lack of isotropy. A lack of homogeneity implies anisotropy but the reverse is not necessarily true. the dependence of the physical properties (mechanical, thermal, electrical, magnetic, and optical) of a substance on direction (as opposed to isotropy, the independence of properties from direction). Examples of anisot-ropy are the following: mica plates split easily into thin leaves only along a certain plane (parallel to this plane the cohesive forces between the mica particles are very small); meat is more easily cut along the fibers; and cotton material is torn easily along a thread (the strength of the material is the lowest in these directions). Natural anisotropy is the most characteristic feature of crystals. For the very reason that the rate of growth for crystals is dissimilar in different directions, the crystals grow in the form of regular polyhedrons—the hexagonal prisms of quartz, the cubes of rock salt, the octagonal crystals of diamonds, and the diverse but always hexagonal little stars of snowflakes. However, not all the properties of crystals are anisotropic. The density and specific heat capacity of all crystals are independent of direction. The anisotropy of the other physical properties of crystals is closely related to their symmetry and becomes more apparent as the symmetry of the crystals decreases. one direction and contract in another (perpendicular to the former; Figure lb). The temperature coefficients of linear expansion along the main axis of symmetry for a crystal (αǀǀ) and perpendicular to this axis (α┴) are different in magnitude and sign. The specific electrical resistance of crystals varies in similar fashion along the main axis of symmetry pǀ and perpendicular to it p±. When light is propagated through transparent crystals (except for crystals with a cubic lattice) it undergoes a double refraction and is polarized differently in different directions (optical anisotropy). In crystals having hexagonal, trigonal, and tetragonal lattices (such as crystals of quartz, ruby, and calcite) the double refraction is maximal in a direction perpendicular to the main axis of symmetry and nonexistent along this axis. The propagation velocity of light in a crystal v or its index of refraction n varies in different directions. For instance, in calcite the indexes of refraction for visible light along the axis of symmetry nǀǀ and perpendicular to it n⊥ are nǀǀ = 1.64 and n⊥= 1.58; for quartz, nǀǀ = 1.53 and n ⊥ = 1.54. Mechanical anisotropy is the variation of mechanical properties—strength, solidity, viscosity, and elasticity—in various directions. Elastic anisotropy is evaluated quantitatively according to the maximum difference in the elastic modulus. 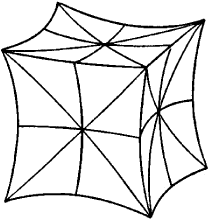 Thus, in polycrystalline metals with a cubic lattice the ratio of the elastic modulus along an edge and along a diagonal of the cube is 2.5 for iron, 3.85 for lead, and 8.7 for β-brass. Cubic monocrystals exhibit three principal values of elastic moduli (see Table 3). For crystals of more complicated structure (lower symmetry), a complete description of the elastic properties requires a knowledge of an even larger number of values (components) of the elastic modulus in various directions—for example, for zinc or cadmium it is 5, and for triglycerine sulfate or tartaric acid there are 13 components which differ in magnitude and sign. The anisotropic properties of crystals are described mathematically by vectors and tensors, unlike the isotropic properties (density, for example), which are described by scalar quantities. For instance, the coefficient for the pyroelectric effect is a vector. 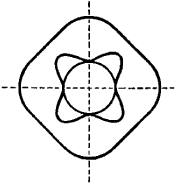 The electrical resistance, the dielectric constant, the magnetic permeability, and the thermal conductivity are tensors of the second order; the coefficient of the piezoelectric effect is a tensor of the third order; and elasticity is a tensor of the fourth order. Anisotropy is depicted graphically by means of guide surfaces (indicatrixes): from one point segments are taken in all directions; each segment corresponds to the constant in one direction. The ends of these sections form a guide surface (see Figures 2–5). yield limit, viscosity, and the ultimate elongation along and across the direction of rolling differ by 15 to 20 percent (up to 65 percent). The reason for natural anisotropy is the ordered arrangement of the particles in the crystals for which the separation between adjacent particles—and therefore the cohesive forces between them—varies in different directions. Anisotropy is caused by asymmetry and specific orientation of the molecules themselves. This explains the natural anisotropy of certain liquids, especially liquid crystals. Double refraction of light is observed in the latter, although the majority of their other properties are isotropic, as in ordinary liquids. Anisotropy is also observed in some noncrystalline substances where there is a natural or artificial structure (wood and the like). For instance, plywood or compressed wood may have piezoelectric properties like crystals because of their laminar structure. By combining glass fibers with plastics it is possible to obtain an anisotropic sheet of material having a tensile strength as high as 100 kilograms-force per sq mm. Artificial anisotropy can also be obtained by creating a fixed distribution of mechanical stresses in a material that was initially isotropic. For example, by tempering glass it is possible to obtain an anisotropy that results in a strengthening of the glass. media under the influence of an electrical field, magnetic field, and mechanical action. Anisotropy is also widespread in animals. Optical anisotropy is found in some animal tissues (muscular and bone). Thus, the myofibrils of cross-straited muscle fibers appear to be composed of light and dark portions. When studied under polarized light these dark disks, like the smooth muscles and certain bony tissue structures, exhibit double refraction—that is, they are anisotropic. In botany anisotropy is known as the capability of different organs of the same plant to assume different positions under identical influences from external environmental factors. For example, the tops of sprouts bend toward the light when illuminated from one side, but the blades orient themselves perpendicular to the direction of the beam. Bokii, G. B., E. E. Flint, and A. V. Shubnikov. Osnovy krislallografii. Moscow-Leningrad, 1940. The departure of the cosmic microwave radiation from equal intensity in all directions. The property of a plant that assumes a certain position in response to an external stimulus. The characteristic of a substance for which a physical property, such as index of refraction, varies in value with the direction in or along which the measurement is made. Also known as aeolotropy; eolotropy. The property of an egg that has a definite axis or axes. In comparison, these dielectric anisotropies were smaller than literature reported anisotropy of polyimides. Yet fine-scale anisotropies have become cosmology's new Holy Grail. Inspired by these hopes, a host of ground-based and balloon-borne instruments have been measuring CMB anisotropies on angular scales beyond COBE's reach. Before answering that question, let's first look at how so much science can be squeezed from CMB anisotropies in the first place. A slightly "tilted" spectrum favoring larger- or smaller-scale anisotropies can be produced in some models and could still fit within COBE's measurement uncertainties. A number of groups in the last two years have detected anisotropies on angular scales of around 0 [degrees] . Some report anisotropies that are above the peak in the graph. Quadrupole anisotropies, which have been reported by other observers and which would be a cosmological problem, do not appear in these data.